Can China Try Open Access? China has increasingly focused on its anti-access capabilities. More openness over intentions would be better. Much has been written over the last several years concerning China's Anti-Access/Area-Denial (A2/AD) strategy, including in The Diplomat. And rightly so – Chinese military planners have devised a strategy that combines the military capabilities of diesel and nuclear submarines, mines, cyber warfare, anti-satellite weapons and swarm attacks by ballistic and cruise missiles. The goal: to slow, limit or deny a superior U.S. force from aiding a potential rival in combat in areas like the South China Sea, Taiwan or elsewhere near China's coast. Such a strategy seems to aim at the heart of American forces in the region. With one A2/AD weapon having been labeled a “carrier-killer” – with a 1,500+ kilometer range anti-ship ballistic missile – it's easy to see why. Yet, for all China’s growing capabilities, there seems to be a lessening utility for such a strategy. U.S. forces, now largely free of major commitments in Iraq and soon Afghanistan, are in the process of rebalancing their focus to the larger Indo-Pacific region. U.S. defense strategists have already begun to develop plans for an AirSea Battle Concept that attempts to negate any Chinese plans, and through new long range bombers, submarines, and forces spread throughout the region, the United States plans to make sure it keeps access to all regions of the Indo-Pacific. Freedom of the seas and global access to the maritime commons has remained for countless decades a hallmark of U.S. interests, and the new U.S. strategy intends to keep it that way. Considering China’s seemingly U.S.-focused battle plan and the U.S. counter strategy, it would appear both nations are trapped in a classic security dilemma, although under new, more modern conditions. Can China continue to build A2/AD weaponry if it runs the risk of a larger more robust U.S. military presence it may find increasingly difficult to counter? The United States for its part can try to contain China through diplomatic, military and economic methods with only mixed results thanks to a highly connected world. What are both nations to do? Is competition and conflict certain? Right now, there are no clear answers to such questions. However, both nations have it in their power to make clear their intentions, both strategically and through diplomatic channels, to help ensure tensions don’t boil over into conflict. With each nation armed with nuclear weapons, there’s all the more incentive for dialogue and increasing clarity. China also has the power to head off such frightening possibilities. While China has every right to build a robust military, there are other options available that are less controversial than specifically targeting U.S. capabilities. Chinese leaders must therefore do more to reassure its neighbors that its rise will be peaceful. One simple idea: retire tired phrases such as attempting to seek “mutually beneficial partnerships.” Such recycled statements ring hollow and make Chinese leaders look as if they are only seeking partners where there are limited objectives, namely natural resource extraction, which is a strengthening narrative being pinned on Chinese diplomacy. In short, the same strategies will only garner the same results. China must begin to establish stronger diplomatic, cultural and economic ties with all of its neighbors in the Indo-Pacific region. The benefits may not be immediate, or little at all. 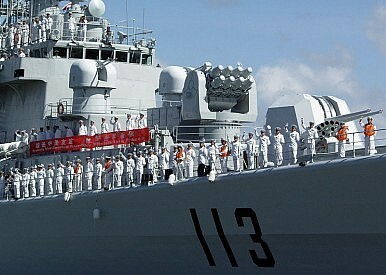 However, as China becomes even stronger in the coming decades, suspicions of its intent will only grow. Fostering long term partnerships and positive relations now will only pay dividends later. Chinese leaders must embrace a more transparent, open, and long-term dialogue with its neighbors. Such a concept, which could be labeled “open-access,” would allow Chinese leaders a measure of diplomatic respect they don’t currently enjoy. If China was to make clearer its intentions in areas like the South China Sea, the utility of its growing nuclear weapons program, its murky relations with North Korea, other nations wouldn’t have to hedge their bets based on what could happen. Chinese diplomats must also scrap unclear claims based on grandiose dotted lines or vague “core interests.” Beijing has an opportunity to clearly state its intentions in the region and its vision for the Asia and Indo-Pacific regions in which its voice, due to its growing power, will be heard. If it doesn’t, others may speak in its silence based on fears that could ultimately be unfounded. While an open-access concept might be difficult to consider with China transitioning to a new generation of leaders in the coming months, those being considered for top positions should look to the international order with a more transparent vision. Otherwise, China may become a more powerful but isolated superpower. The activation of China's first desalination plant on Woody Island improves the island's livability.